Instruments: Bells, Recorder, Xylophone, Boomwhackers, Guitar, Violin and/or any treble clef instrument. 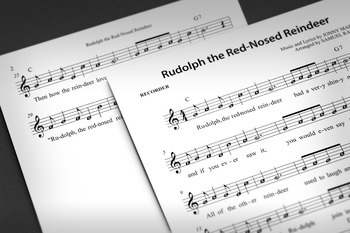 Rudolph the Red-Nosed Reindeer is a fictional male reindeer with a glowing red nose, popularly known as "Santa's 9th Reindeer." When depicted, he is the lead reindeer pulling Santa's sleigh on Christmas Eve. The luminosity of his nose is so great that it illuminates the team's path through inclement winter weather. 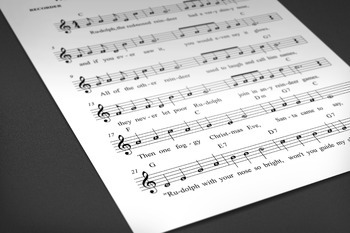 Spice up your Christmas concert with this holiday classic. 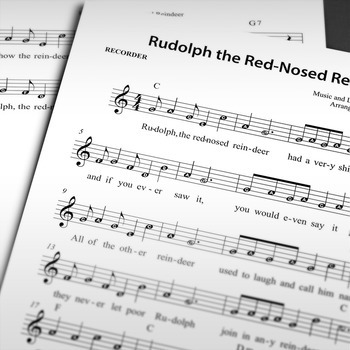 Download today and experience the joy of music with your students! Don't forget to Follow Me and Rate this File (I love 4 stars). All rights reserved by author. Permission to copy for single classroom use only. Electronic distribution limited to single classroom use only. Transmission, reproduction, or reuse of protected material, beyond that allowed by the fair use principles of the copyright laws, requires the written permission of the copyright owners. You may also be interested in my other TOP-SELLING products for. 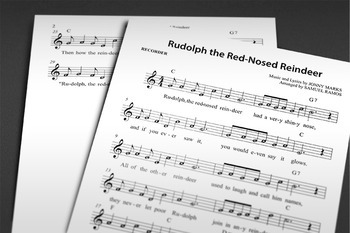 . .
FAQ: Why won't the sound play from my Interactive PDF? You might not be able to listen to the sound of the audio file because most Macintosh computers use the Preview Application to view Adobe PDF files. To benefit from the interactive features of the file, download the most recent version of Adobe Reader --Don't worry it's a FREE application. If you currently have Adobe Reader installed in your computer, right-click on top of the file and select Adobe Reade to open the file. I would recommend setting Adobe Reader as your default PDF reader.